Quick Pay is a user-friendly Malaysian payroll & human resource (HRMS) management software designed to suit Malaysia labour law. It provides Easy Data Entry, Simplified Flow and incorporated with Internal Power Reporting tool - plus Data Exchange capabilities to popular Windows word-processors and spreadsheets applications. QUICK STAFF, an effective tool to manage your Employee Historical Information & Human Resource needs EASILY and EFFICIENTLY! 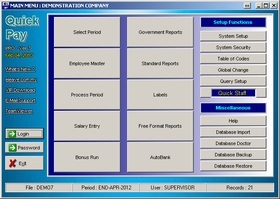 It provides Quick-&-Easy storage & reporting system on employees' historical information. It allows an unlimited record storage of 17 Easy-to-Use Human Resource modules that fully integrates and compliments QUICK PAY. Modules included are Accident, Achievement, Appraisal, Benefit, Career Development, Discipline, Education History, Events Planner, Family Detail, Insurance, Leave Detail, Non-Paid Leave Detail, Skill, Training, Working History, Picture Library, Others (user define). Existing customers MUST use ONLINE UPDATE feature within program. Do not use this download. 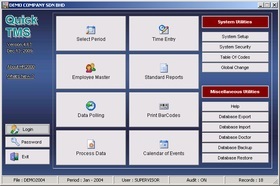 Quick TMS (Time Management System) has been specifically engineered to satisfy both simple attendance monitoring & complex 24-hours rotating shift environment. It provides extensive facilities to allow definition of employee working patterns using Time Zone logic control. Exceptions on employee's expected working hours are highlighted, including lateness, early leaving, unapproved overtime and absence. Payable hours are calculated and finally transferred to QUICK PAY - Payroll system. Incorporated with 80+ clock formats such as barcode, magnetic, proximity, MiFARE, finger scan, palm scan, and face recognition. Buy direct from Manufacturer & Save ! HR2000 e-Office (Leave/Claim systems) is a web based Employee Self-Service (ESS) system that simplifies the process flows of planning, applying and approving of leave & claim management. Handling all types of leaves & claims, it empowers your employee and department heads to self manage application and approval flow anytime, anywhere, whether in the headquarters or its group of companies/subsidiaries all over the world. Now, you can save time without messy forms, improve employees’ satisfaction, and reduce administrative cost. E-OFFICE webSPACE (ESS module) is a self service facility that enables employees to access their E-payslip, E-CP8A/E-CP8C and E-PCB2 documents directly from a secure web site. It also lets Human Resource departments to upload & share corporate bulletin files to your employees within a secure and convenient storage area. Leave application, time-off application, powerful leave ruling, multi-level approval, calendar view, file attachment during application, e-mail notification, e-mail reminder, company logo & banner, bulletin board, E-Storage module, mobile login, lost password, etc. Direct upload from QUICK PAY. Your data is safely hosted, backup & fully managed in HR2000 dedicated server with MSSQL.